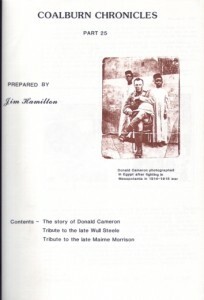 Jim Hamilton produced unique versions of his well read and well travelled Coalburn Chronicles booklet which he also sent to many former Coalburn residents throughout the world. These booklets amounted to 80 in number and were issued from 1970 until April 1998. "My aim is to make the books readable to all; my hope is that they will still be read in the years ahead. One elderly lady, whose family history I recorded in a booklet, bought 20 copies - one for each of her children, grandchildren and great-grandchildren, secure in the knowledge that her offspring will want to know specific aspects of their family history and its link with Coalburn in the generations ahead...... As I prepare Issue 40, it has been suggested to me that Coalburn now has possibly the best-documented set of family histories for any village in Britain. 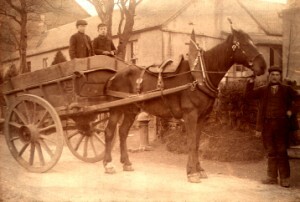 What I am certain is that the source of stories about the village and its inhabitants seems boundless." Jim then continued to interview many individuals in the district using video equipment, compiling 80 videos over the next few years. He also made videos of Old Hamilton, The Clyde Valley and Old Larkhall. Jim compiled booklets relating to surrounding villages - Lesmahagow, Kirkmuirhill, Blackwood, Douglas, Glespin, Douglas Water and Rigside. It was always Jim's intention that his writings, photos, etc., should eventually rest in Coalburn and following his death in April 2004, his wishes were carried out by his wife Maureen who arranged that his vast archive be passed into the keeping of the people of the village. 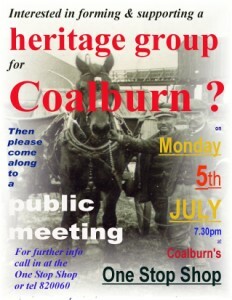 A public meeting was held at Coalburn One Stop Shop in July 2004 and a Heritage Society was set up in an endeavour to continue and build on the remarkable work which Jim so willingly carried out in his lifetime. It was only proper, therefore, that his name should be carried on so that future generations might appreciate his labours.